On 29th September 1966, from a tiny attic in the Dorchester Conservative Club, members of the newly formed Dorchester Hospital Broadcasting Society presented the first record request programme to patients in the old Dorset County Hospital. 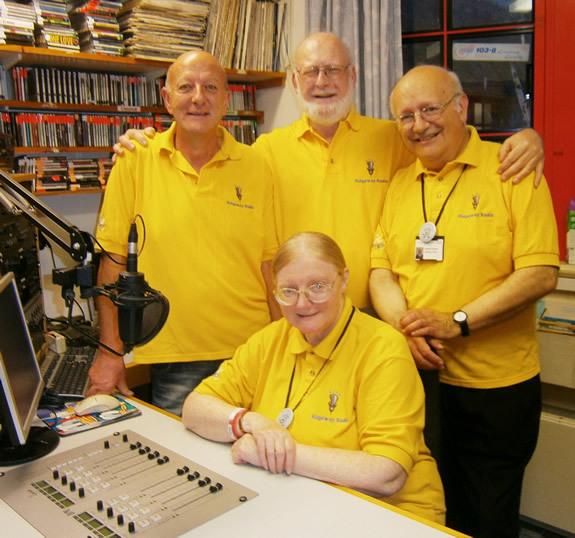 On the same date in 2011, and at exactly the same time – 8pm, some of the founder members of the DHBS and members of its successor, Ridgeway Radio, presented a celebratory programme looking back at some memorable moments of those 45 years. The team were joined in the studio by Jean O’Callaghan, the Chief Executive of the Dorset County Hospital NHS Foundation Trust, and another hospital radio stalwart, Gary Penfold. We are very grateful to Anita Harries for the photograph below. Pictured are, from left, Andy Venton, Andy Worth and Peter Foster with Heather Foster seated at the mixing desk. The four are part of a much bigger team who now run Ridgeway Radio, either as presenters or ‘back-room’ people.